Perhaps it has become clear to you that for your relationship to thrive you need to collaborate, handle surprises, and communicate well with each other. That may be harder than you expected, but it is true. Everyone’s relationship gets tippy or sails through choppy waters at some point. 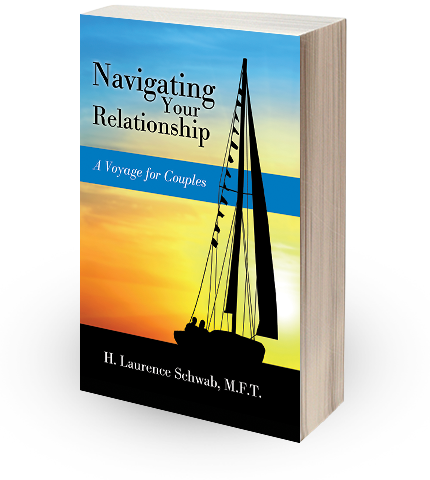 As author H. Laurence Schwab, M.F.T., tells us, it may be very helpful to equate this challenging journey with owning and sailing your own boat, and sharing the ups and downs together. He suggests that if you both take care of yourselves effectively, see yourselves as captains, listen to each other, and share a journey of exploration and authenticity, you can reach the destination you desire and need. Thanks to a compelling childhood experience around his father’s love of sailboats, a family emphasis on art that made it seem natural to think in metaphors, and nearly thirty years as a marriage and family therapist, Schwab offers a journey of self-exploration and imagination that is intended to reduce tension in your relationship. Written with the comforting tone and the warmth of a validating therapy session, the text balances your need for a better understanding of what has happened to your relationship and your need for bracing solutions that help you feel like things are under control, while offering multiple opportunities for a private ah-hah moment as a particular metaphor or story resonates with your experience. You’re looking big because I’ve been hurt before and this feels familiar. This natural distortion makes us feel like we need control, and there are ways to meet that need and enhance a relationship, rather than making it more toxic. Intentionally use curiosity and consideration for your partner. This is a practical, systemically oriented guide that couples and clinicians working with couples will find helpful in navigating the complex, often turbulent, waters of intimate relationships. Through his creative use of metaphor- building and steering a boat- Schwab targets significant aspects of relationships, such as defining each partner’s limits of responsibility, viewing intimacy as a celebration of differences, accepting our own vulnerability, and bringing personal integrity to our interactions in the present. The focus on viewing challenges and conflicts as opportunities to experiment with new skills and remaining open to new ways of thinking is a refreshing shift from the conventional way of looking at human behavior in terms of fixed realities and pathology. – John Brendler, MSW, ACSW, LMFT, family and marital therapist, and founder of Building Bridges, a multidisciplinary, holistic healing context in Media, PA – Co-author of Madness, Chaos, and Violence: Therapy with Families at the Brink. – Teacher, leader of supervision groups, and international seminar leader in family therapy. – Recognized expert in dealing with dangerous symptoms, destructive relationships, and families in serious trouble.